The Pennsylvania Superior Court has decided the case of Commonwealth v. Trahey. In Trahey, the Court held that because Philadelphia Police were understaffed, failed to respond to the incident in a timely manner, and did not have procedures in place for quickly obtaining a warrant by electronic means, officers were justified in conducting a warrantless blood draw of a suspect who had been arrested on suspicion of Homicide by DUI. The opinion is an absurdity which suggests that because the Philadelphia Police have not taken adequate steps to investigate cases and create procedures for quickly obtaining search warrants even in potential homicide cases, they can ignore the United States Supreme Court's holding in Birchfield that drawing a suspect's blood in a DUI case requires voluntary, uncoerced consent or a search warrant. On September 4, 2015, which was Labor Day weekend, 911 dispatchers received a report that a car had struck a cyclist on the 4900 block of Wynnewood Avenue in Philadelphia. Despite the call about someone being struck, police were not dispatched to the scene until approximately 45 minutes after receiving the call. Officers testified that this was “due to the lower priority of auto accidents on the hierarchy of circumstances in which Philadelphia Police Officers are dispatched to emergency situations.” The 911 call did not mention that this may be a DUI-related crash or that someone had been seriously injured. Upon arrival, police officers observed a smashed bicycle and a pickup truck that was partially on the sidewalk. The police testified that the truck’s hood and grill were damaged, its windshield was shattered, and there was blood on the street. The officers spoke to a group of bystanders who informed them that the defendant had been driving the truck and the cyclist, who he had hit, had been transported to the hospital. Unfortunately, the cyclist died as a result of this incident. The defendant told one of the officers that he was the driver of the truck that struck the cyclist. While speaking with the defendant, the officer noticed that the defendant had a strong odor of alcohol on his person, his speech was slow and slurred, his eyes were glassy, and he had an unsteady gait. Based on these observations, the officer believed that the defendant was under the influence of alcohol. The officer arrested the defendant for DUI. It does not appear that any field sobriety tests were performed despite the fact that the officers were on the scene for approximately 45 minutes before they arrested the defendant. They then left the scene to transport the defendant to police headquarters for booking and presumably for a blood test. While en route to police headquarters, the officers were called back to the scene by the Accident Investigation District (AID). AID is a unit that investigates car accidents and DUI cases. One of the AID officers examined the defendant and also noticed signs of intoxication. The AID officer learned that nearly ninety minutes had already passed since the crash. This is significant because police have two hours to do a blood test or a breathalyzer after they arrest someone on suspicion of DUI. After two hours, the results of the test become significantly less accurate. The rules therefore suggest that a court should not allow prosecutors to use the results of an untimely test. Consequently, one of the AID officers sent the defendant back to the police headquarters for a blood test and/or breathalyzer. When the defendant arrived at police headquarters, he gave verbal consent to the blood testing, and he signed a 75-439 form which is the written version of these warnings. However, on this form, he did not check the box that consented to blood testing. After all of this, the defendant had blood taken from his arm. It was two hours and five minutes after the accident occurred. The defendant was subsequently charged with homicide by vehicle, homicide by vehicle while driving under the influence, involuntary manslaughter, and DUI. He then filed a pre-trial suppression motion in which he argued that the police subjected him to an unlawful search by taking his blood without a search warrant. Several police officers testified at the hearing. They generally testified that officers would not have had sufficient time to seek a warrant for the chemical testing of the defendant’s blood within two hours of the accident. They also testified that a significant amount of time had elapsed before the officers were able to respond to the accident scene and that they did not know this was potentially a DUI related accident. It is important to remember that the 911 call did mention that someone had been struck by an automobile, yet apparently this had no effect on the promptness of the Philadelphia police’s response time to the scene of the accident. The officers provided a number of different reasons for why they could not get a warrant within the two-hour time frame. This included: it would have taken too long to type up the warrant, drive from the accident to the AID headquarters, communicate with the on-call prosecutor for approval of the affidavit, arrange to meet with an available commissioner to consider the warrant application, travel to arraignment court, wait for a commissioner, have the commissioner review the application, and then return to the police headquarters with the approved request. The officer estimated that the entire process could take anywhere from seventy minutes to three hours. At the conclusion of the hearing, the trial court granted the defendant’s motion to suppress. The trial court held that the defendant’s oral consent was invalid because of the United States Supreme Court’s decision in Birchfield v. North Dakota (which holds that the government cannot subject you to a penalty by refusing to consent to blood testing). However, the suppression court did not address the exigent circumstances argument posed by the Commonwealth. The Commonwealth then filed a timely interlocutory appeal. What is the “Exigent Circumstances” Exception to the Warrant Requirement? Article I, Section 8 of the Pennsylvania Constitution and the Fourth Amendment of the United States Constitution protect individuals from unreasonable searches and seizures. Usually, this means that if the government wants to go into your home or take something from your body (i.e. blood) the government needs a warrant to do so. However, throughout the years, both federal and Pennsylvania case law has evolved to include an “exigent circumstances” exception. Typically, this is limited to circumstances where there is a reasonable belief that evidence will be destroyed unless the police take prompt action. Courts use a totality of the circumstances approach to analyze the facts of a particular case in determining whether there were exigent circumstances. To give an example of exigent circumstances, let’s say a police officer sees someone engage in a hand-to-hand exchange of drugs for money. The police then approach the defendant, and he runs into a house. The police officer follows him into this house and seizes drugs from his person. At a motion to suppress, the Commonwealth may reasonably be able to argue that there were exigent circumstances because if the police officer had not gone into the house, the defendant would have had time to flush the drugs down the toilet or find some other way to destroy them. Therefore, depending on all of the circumstances, a court could rule that the officer was not required to obtain a search warrant and deny the defendant’s motion to suppress. The exigent circumstances exception has been applied in DUI cases, as well. This is understandable to some extent because alcohol in a person's blood dissipates relatively quickly. However, exigent circumstances do not automatically apply in DUI cases solely from the fact that alcohol eventually dissipates. The United States Supreme Court addressed this issue in the case of Missouri v. McNeely. The Court held that the natural dissipation of alcohol in a person’s bloodstream is not a per se (automatic) exigency and held that the police are not free from the requirement of obtaining a search warrant to obtain a DUI suspect’s blood. However, McNeely also did not hold that the police must always get a warrant to take a DUI suspect’s blood. The McNeely court acknowledged that obtaining a warrant is not always practical in DUI cases. Therefore, in cases where the police do not get a warrant, courts must analyze the facts of a given case to determine whether it was objectively reasonable for the police to draw blood without a search warrant. In Trahey, the suppression court did not address the issue of exigent circumstances. Nonetheless, instead of remanding the case for the suppression court to consider whether there were exigent circumstances, the Superior Court improperly decided to conduct the analysis itself. Of course, it found that there were exigent circumstances in this case. What is absurd about the Superior Court’s decision is that the exigent circumstances that the Court found in favor of the Commonwealth were entirely created by the Philadelphia Police Department's poor performance in giving the call priority and failure to create electronic or telephonic procedures for obtaining a search warrant. 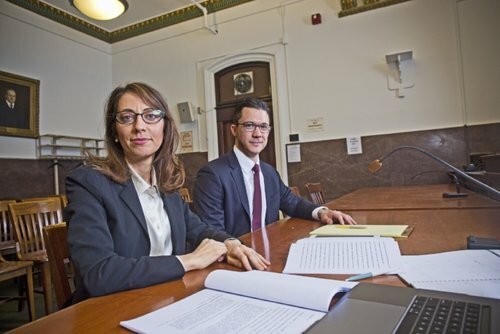 Such procedures for quickly obtaining a search warrant in emergency situations obviously exist in countless jurisdictions both small and large throughout the country, but the Superior Court refused to suggest that a jurisdiction as large as Philadelphia should be expected to implement them. The Superior Court gave a slew of reasons as to why there were exigent circumstances in this case. One of the reasons was that that the officers did not arrive on scene until 45 minutes after the accident. However, this was because the emergency dispatch in Philadelphia does not prioritize car accidents for police response (apparently even when the 911 call indicates that someone has been hit). Further, when the police arrived on scene, it took an additional 45 minutes for the officers to determine that the defendant may have been under the influence of alcohol or a controlled substance. This determination was not because the officers had the defendant engage in any field sobriety tests. Rather, it took this long based on their observations of the defendant and conversations with him and bystanders. Additionally, the Superior Court noted that on this particular night, the Philadelphia police lacked manpower because only 5 AID officers were assigned to Philadelphia on Labor Day weekend. As such, all of these exigent circumstances were a consequence of the failures of the Philadelphia Police to be adequately prepared. Thus, arguably, the police created the exigent circumstances in this case. Courts have held that if the police create the exigent circumstances, they are not entitled to sidestep the protections of the Pennsylvania and the United States Constitution. However, the Superior Court’s decision in Trahey does exactly that: it incentivizes the police to not be prepared so that they can later claim exigent circumstances and evade the Constitution's search warrant requirement. Trahey will likely be appealed, and hopefully an en banc panel of the Court or the Pennsylvania Supreme Court will reverse it and require law enforcement to comply with the Pennsylvania and United States Constitutions. DUI cases can be complicated. However, there are several ways to beat them. If you are charged with DUI, you need a skilled attorney with the knowledge and expertise to fight your case. Our award-winning Philadelphia criminal defense lawyers have successfully defended countless DUI cases. We offer a 15-minute criminal defense strategy session to any potential client. Call 267-225-2545 to discuss your case with an experienced and understanding criminal defense attorney today.